We are blessed to invite you all for our happy Easter party this weekend. It's a great reason to gather and celebrate this festival. 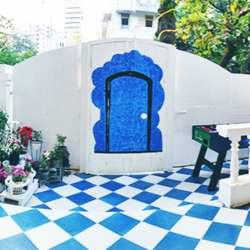 On popular demand, we will meet up once more at our favorite place: The Little Door in Bandra. As usual, we will offer two welcome drinks and floating starters. Additionally, we will try to give you a light flair of a happy Easter bunny atmosphere to celebrate in style. The Little Door knows exactly how to make every evening refreshing and exciting. Being the neighborhood bar becomes easier when you manage perfectly well to provide a sense of belonging with a personal touch. There are so many little things that we'd like for you to come and experience yourself. This modern European bar is set on two levels with four distinct areas. A picnic style corner, a shaded bower and patio, a quiet nook, and a quintessential cocktail bar upstairs. So, we are super excited to celebrate with you!